The Chamic language family is often cited as a test case for contact linguistics. Although Chamic languages are Austronesian, they are claimed to have converged with Mon-Khmer languages and adopted features from their closest neighbors. A good example of such a convergence is the realization of phonological register in Cham dialects. In many Southeast Asian languages, the loss of the voicing contrast in onsets has led to the development of two registers, bundles of features that initially included pitch, voice quality, vowel quality and durational differences and that are typically realized on rimes. 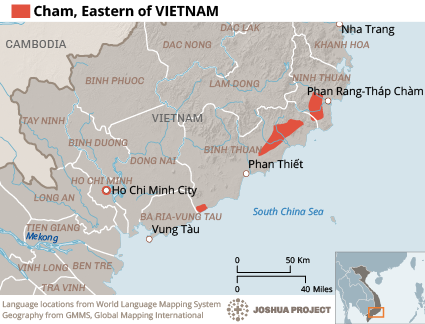 While Cambodian Cham realizes register mainly through vowel quality, just like Khmer, the registers of the Cham dialect spoken in southcentral Vietnam (Eastern Cham) are claimed to have evolved into tone, a property that plays a central role in Vietnamese phonology. This dissertation evaluates the hypothesis that contact with Vietnamese is responsible for the recent evolution of Eastern Cham register by exploring the nature of the sound system of Eastern Cham from phonetic, phonological and sociolinguistic perspectives. This entry was posted in Language [Ngôn Ngữ] and tagged Cornell, dissertation, Eastern Cham, Marc Brunelle, Ngôn ngữ/ Language, Nước ngoài. Bookmark the permalink.